Tonight, Punta Gorda Town continues to reel after police shot and killed a man under questionable circumstances. 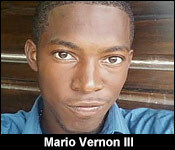 He's 24 year-old Mario Vernon the Third, and he has a brand name as the grandson of the late Belizean Brukdown Queen, Leela Vernon. Now, the fatal shooting is under heavy scrutiny because of 3 elements. First, Mario Vernon had many run-ins with the police. His friends and family tell us that he was always being accused of some sort of petty crime. 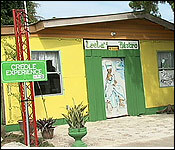 24 year-old Mario Vernon the third, the man who police shot and killed on Saturday night in PG, was the grandson of the late Creole Belizean icon, Leela Vernon. "He was staying here at my residence, at Miss Leela Vernon's residence. And everybody knows Ms. Leela Vernon. 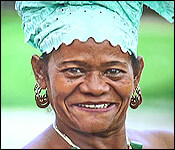 She's the National Hero of Belize, a member of the British Empire. So, I controlled this yard right here, and I had my nephew here with me. We were living here together on everything. And I advised him, like I said, and I tried to talk to him." And the reason that Franz Vernon was trying to advise him is that Mario Vernon, his deceased nephew, kept bringing police attention to Leela Vernon's property which has been turned into a museum in her honor. 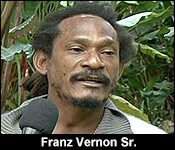 Franz Vernon freely acknowledged that his nephew was in and out of police custody. "My nephew, he was no angel, the man was in and out. Police was already having to deal with him because I talked to him. He's my nephew, and I tried my best to advise him, and talk to him because I have sons who are as old as he." "You have the man; keep him and lock him up, or charge the man. You don't have to come and kill the man like that." A cold-blooded killing, that's how Mario Vernon's friends and family see his fatal shooting which happened at around 9:30 on Friday night. We'll get to their account, but first, we start with the official police explanation of what happened. "Whilst police were on patrol on George Price Street, Punta Gorda Town, they observed one Mario Vernon with what appears to be a firearm in his hand. Upon seeing the police, he started moving away, and they police then drove off and on to Main Middle Street, Punta Gorda Town, in the direction where Vernon was going. According to the police officer, he then exited the police vehicle upon seeing Mr. Vernon, and at the time of him seeing Mr. Vernon, he noticed Mr. Vernon walking away from him, and pointing a firearm toward him. And as a result, he drew his service revolver, and fired one shot." Our investigation on the ground all day in PG has fleshed out a story which contradicts all major elements of this officer's account to his police bosses. Multiple sources in the town told us that the officer who shot Mario Vernon got into some confrontation with him a couple hours prior to the fatal shooting. There were reportedly some hard words uttered, and Vernon went along his way. The officer supposedly came looking for him at his friend's house on George Price Street, the same area where he was shot. A short while after Vernon arrived in the neighborhood, the same police officer returned, and supposedly they spotted him walking into this yard. 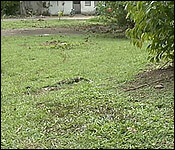 The police mobile went on the adjacent street, and Vernon was seen in this yard, sitting in the dark. It was believed that he was rolling up a stick of weed which he was about to smoke, but the officer reportedly came from behind and shouted at him to "freeze". He was reportedly seen standing up with his hands in the air, and before he could turn around, the officer shot him in the back of the head. "The way how he was shot and killed, he never deserved that kind of punishment. After that my nephew went - the information I got - across the yard, and was calling his father on the phone, and that was the time that the officer came from behind and told him to get up. He lifted his hands up, and he was shot right there; no running, or no other kind of stuff that they put out on the media happened. So, I don't know where they got those information from." Police say that they found a weapon where Vernon had collapsed after he was fatally injured. "The scene was processed, where one 380, Lorcin brand, pistol was found on the scene. Police have launched both a criminal and internal investigation into this matter. We have been given several information, and several leads which we are working on at this point in time. The officer in question is also detained at this time, pending this investigation." "I want to know which man has enough manhood to stand up with an unlicensed gun in front of officers, and the officer will come 2, 3 or 4 times, and you will still stand up there. I don't think anybody in their normal sense will do that. And, if the officer knew - because they said they knew he had gun, why didn't they come with an entire entourage to apprehend this gunman then?" Again, on the ground, the accounts are that this was not a tidy and by-the-books police shooting. Sources told us that the scene was not properly secured, and that it would not have been too difficult for a weapon to be planted. In fact, one off-camera interviewee told PGTV News that he and others went with the officer who shot Vernon, and did a search. He asserted that no weapon was found. "3 of us were witnesses, or 5 of us, after the officer killed Mr. Vernon, 5 of us went with the officer, back on the scene. And we searched Mario Vernon, and we found no gun." The bystanders also take issue with the fact that the police, from their account, the officer handled Vernon's body without dignity. They say he was dragged out to the road side and then roughly thrown into the back of the police mobile. He was taken to PG Town Hospital, where he was pronounced dead on arrival. "And, the way how my nephew, after he was shot, his body was there. He was already dead. He was dragged, like a worthless piece of nothing, dragged and thrown into the vehicle, and taken to the hospital. When I arrived there, he was dead already. To me, this looks like a whole - this thing doesn't look right to me. So, the family, they are doing their investigation with their attorney, and so." And then, there are multiple accounts that responding officers came after the fact, and took away a lady's phone. She was videotaping the entire aftermath on her device, which was confiscated. The videos were later deleted. "I was at the station the same time the young lady, whose phone was taken away, was there at the station. And she was mad. She was telling them why they chanced the youth man, why the did this to him. That man never deserved that, and she want her phone because, it's just like a robbery. Someone just come and grabbed your phone. If somebody do that, that's a charge, to grab someone's phone and take it with you, and then return it back afterwards." Police say that they are conducting a criminal and an internal investigation into this shooting. "All the information that was given to us, and included those, are being followed by the police. Myself, Mr. Williams, the Commander of the Professional Standards Branch, were on the ground for the entire day yesterday, and I believe he may have gone back down there today." And they have a grieving family that's watching their every move like a hawk. "He's just 24 years-old. That's not the way he was gonna remain. People change. The man had his entire life ahead of him. So, they cut the man's life short, and I don't know if they feel happy about what they did. But, it cannot go like that." "My family, we are here in this town for over 200 years. We are one of the oldest families here. We did a lot for this town, and everything, and to allow my nephew to go like that, justice has to be served here." Notably, the police did not make the lead investigator - who is ACP Chester Williams, the commander of the Professional Standards Branch, available to answer the media's questions today. He should have been there since he is most familiar with the fine details of a sensitive case with high levels of public scrutiny and distrust. Last night, we took you to Punta Gorda Town for our coverage of the very controversial killing of 24 year-old Mario Vernon, grandson of the Late Belizean National Hero, Leela Vernon. The official police version of the fatal police shooting was that Vernon had a weapon, and that he pointed it at Police Constable Tevin Aranda, who shot him in the head, in self-defense. Residents insist that police planted this weapon after the killing to cover up the unjustifiable use of deadly force. Well, after the public outcry from PG Town, police announced today that 23 year-old Tevin Aranda, a police constable attached to the PG Police Station was, quote, "charged for manslaughter as directed by the Office of the DPP" End quote. So why not murder? 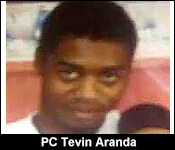 Well, apparently, there's no evidence that PC Aranda intended to shoot Vernon in the head. He did shoot him, yes, but the charge suggests that the DPP believes he did it unintentionally, like an accident. The shooting happened on George Price Street in PG, but Aranda was not arraigned at the Magistrate's Court there. 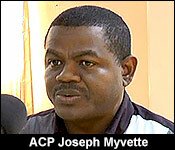 Instead, he was taken to the Dangriga Magistrate's Court, and he was released on bail of $10,000. And if the police was hoping that this development would help to cool off some of the public outrage and distrust from this shooting, it certainly hasn't, not for the family at least. Today, their attorney, Leeroy Banner, sent us a statement via text message. It says, quote, "The Family of the late Mario Vernon is flabbergasted to learned that PC Tevin Aranda was charged with Manslaughter, and not murder, when all the evidence points to murder. There are several eyewitnesses who have described to the police in detail, how PC Aranda waylaid the deceased and then executed him in cold blood. The Family finds it strange that the police officer shot the Mr Vernon, who was unarmed, behind his head... only [to] be charged for Manslaughter." Police Sources have told us that contrary to the official police report, Aranda was not on police patrol. We're informed that he was sent on an errand with a female officer for urine test kit, and that he ventured on George Price Street while on that errand. 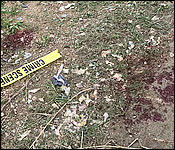 The community's allegation of the gun being planted remains a very live issue. 1 registered members (cracked up), 244 guests, and 9 spiders.